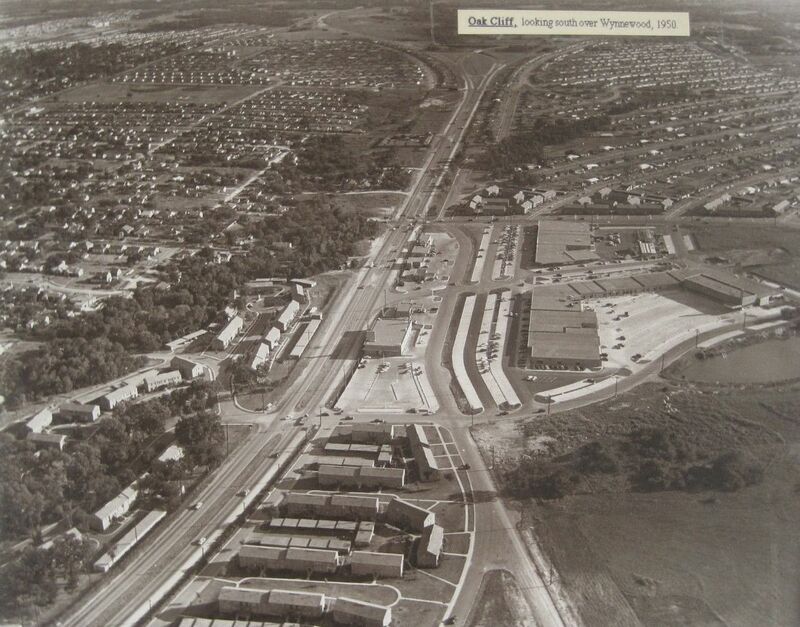 Above, looking south down Zang Blvd. in 1950 — see the same view 60-some-odd years later via Google, here (the “current” satellite view is pretty out-of-date, but you get the idea). Watch a great little 22-minute film from 2013 on the development, rise, fall, and rebirth of Wynnewood North, “Neighborhood Stories: Wynnewood North,” here, produced by the Building Community Workshop (make sure to watch the video in full screen). There is an impressive companion booklet with more photos, here, which you can browse through page by page (hover over the cover and click on the “full screen” icon). 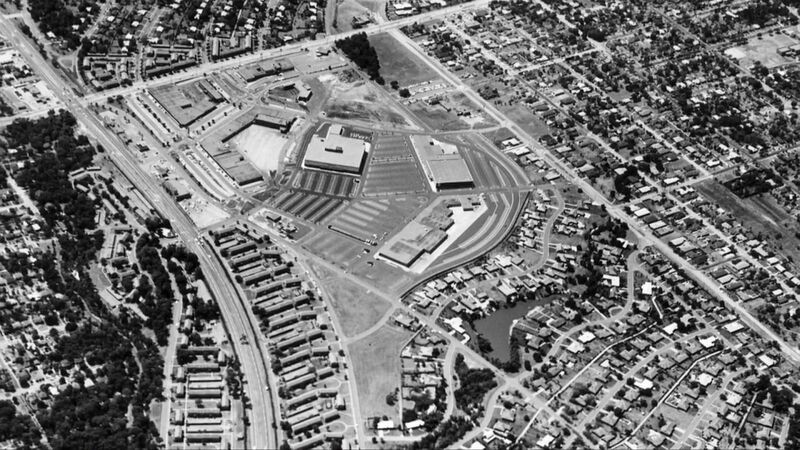 1961 aerial shot from the short film linked above, “Neighborhood Stories: Wynnewood North”; photo provided by resident Janice Coffee. 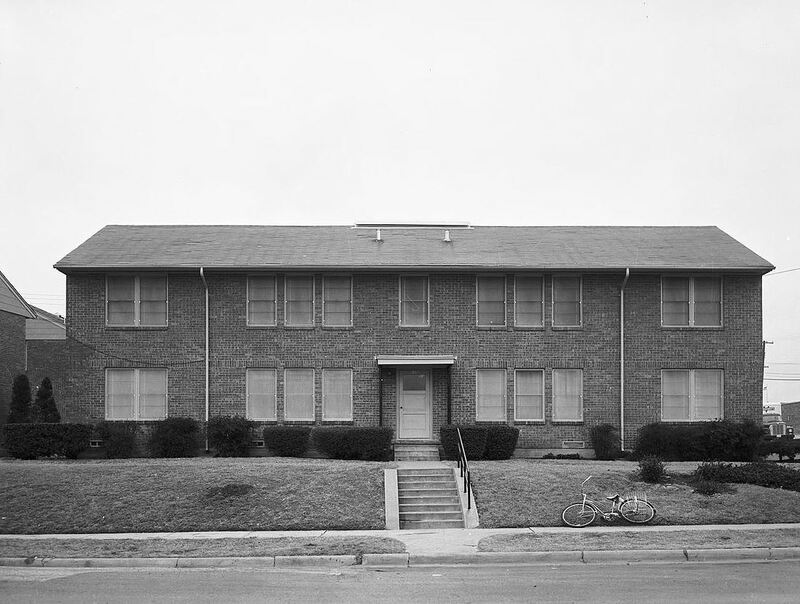 Wynnewood apartment buildings: with bike, taken by Squire Haskins on March 4, 1954, from the Squire Haskins Collection, UTA — more info here (click thumbnail on that page to see huge image). 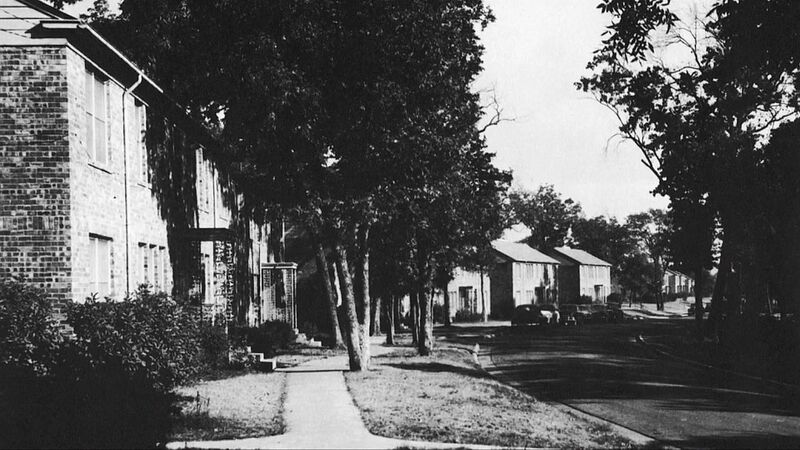 Second photo of Garden Apartments is a screenshot from the “Wynnewood North” film; Dallas Public Library photo. 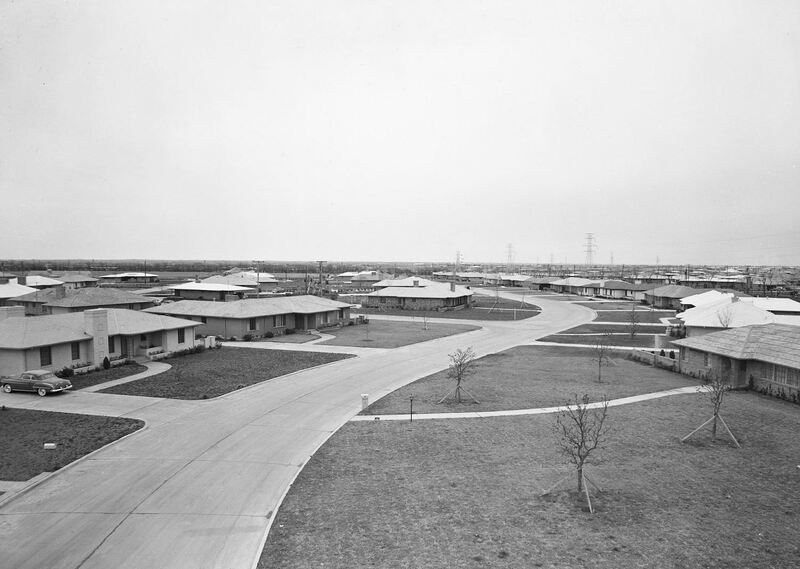 “Birds-eye view” of neighborhood taken by Squire Haskins on March 4, 1954 (described as “possibly Wynnewood” by UTA) — more info from UTA here (click that thumbnail for BIG image). More Wynnewood photos from UTA here. 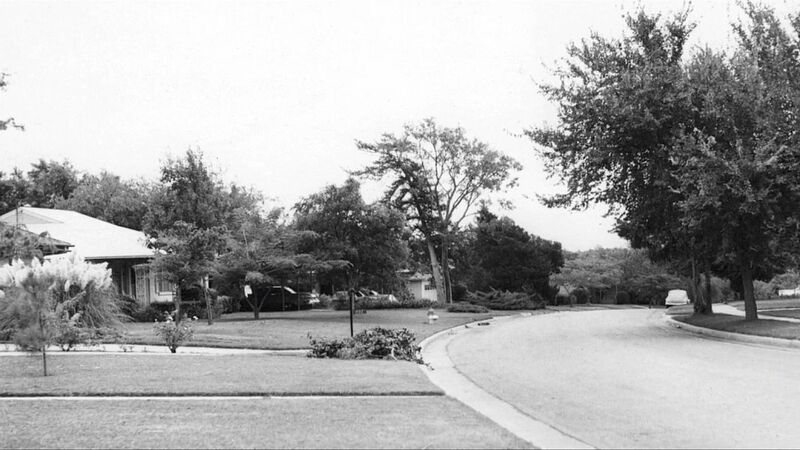 Photo of 1961 residential street from the “Wynnewood North” film, provided by Janice Coffee. 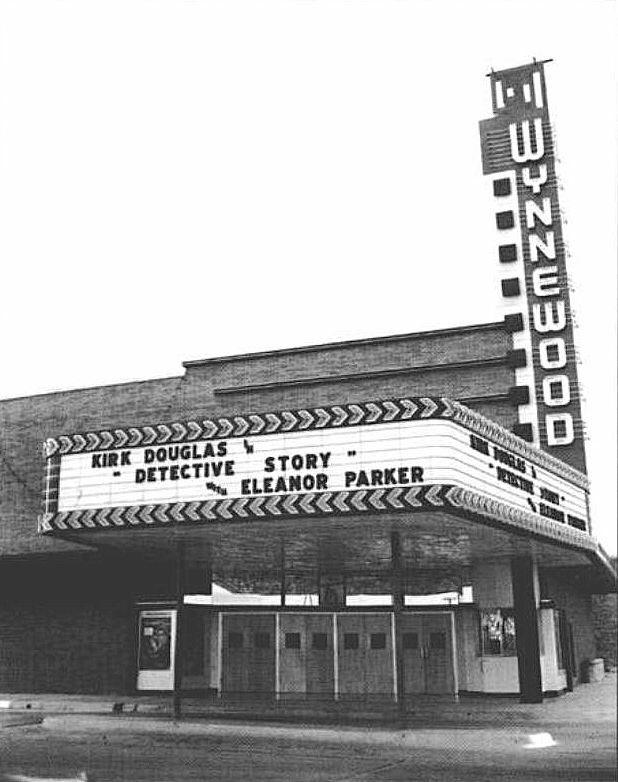 1950 photo of Wynnewood Theater is also from “Wynnewood North” film (Hayes Collection photo, Dallas Public Library). 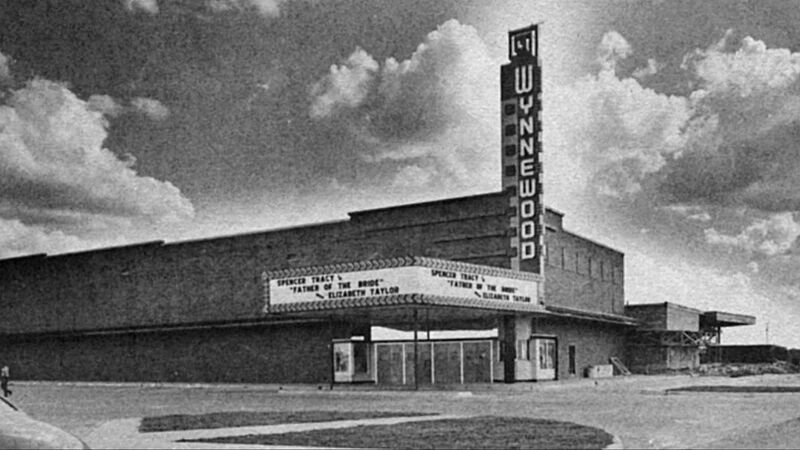 1951 photo of theater from the article “Wynnewood: ‘A Tonic to the Shelter-Hungry Nation'” by Ron Emrich (Legacies, Fall 2002) — GREAT history — read it here. Angus Wynne, Jr. photo from Pinterest. More photos from the Dallas Public Library, here. More about Wynnewood from Wikipedia, here. Even more from this Oak Cliff Advocate article by Gayla Brooks, here (this is an instance where I would encourage people to read the comments!). All photos are larger when clicked. The environment in it’s first 30 years was magic. Fond memories! WE lived in Oak Cliff and I was born there, or at St. Paul Hospital in Dallas. 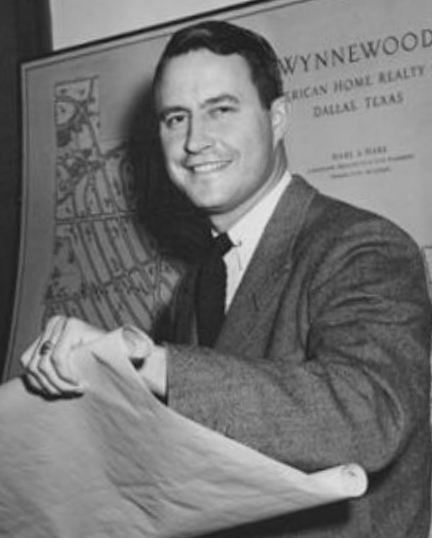 WE never thoutht of our part of Oak Cliff as being “West Dallas” but we did live west of the Trinity. Great article & pictures. 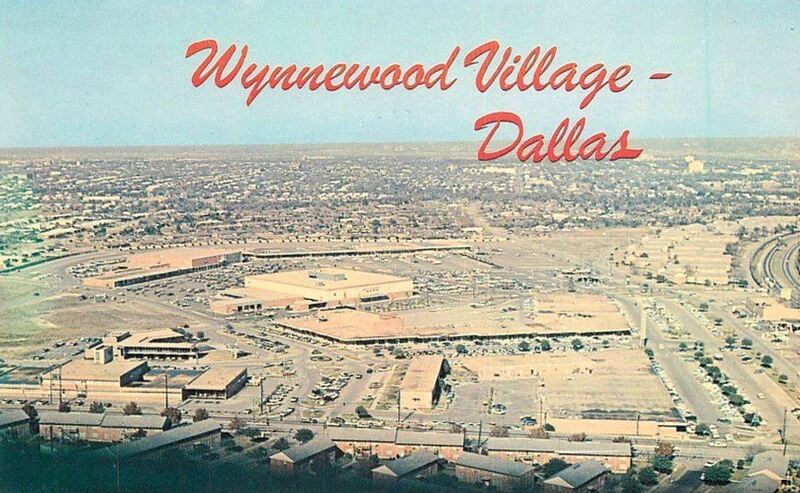 I lived a little further south in the Polk Terrace area, but Wynnewood was always my Mom’s “go to” shopping destination. 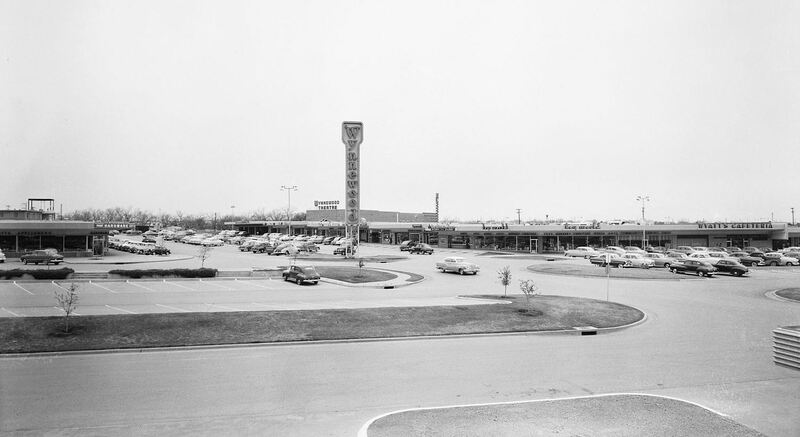 That and the A. Harris Shopping Center at Kiest & Hwy. 77. Spent many hours in that theater, especially on Saturdays. S and H Kreske’s (with the old stainless steel countered soda fountain), Toy World, a bakery where mah mother always bought us cupcakes, Fred’s Barbecue, Wyatt’s Cafeteria….. Watched part of the film…yesh…JAN”S Bakery….can we face the fact that The Decline came with the growth of a disaffected Black population?